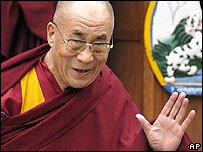 Many Tibetans believe that only the Dalai Lama can save Tibet from extinction. But even a Dalai Lama is mortal. And they are deeply anxious about what will happen when the present one dies. For Tibetans, he is not just a Buddhist monk, a god and a king - the latest in a centuries'-long line of spiritual and temporal rulers - but a larger-than-life symbol of their unique civilisation. For the past 50 years, from his sanctuary on the other side of the Himalayas, the 14th Dalai Lama has kept alive their dreams of survival as a separate people. Many fear that his death will rob them of their last chance of any genuine self-rule. Others predict chaos and bloodshed. Tibetan extremists might finally feel free to resort to terrorism, giving Beijing the chance to crack down harder. The Dalai Lama fled to India in 1959, amidst a failed uprising against the Chinese occupation which had begun nine years earlier. Since then he has been the face of Tibet for the outside world. He has won the Nobel Peace Prize, the public backing of film stars, and the private support of presidents and prime ministers. But no country recognises his government-in-exile. And as China's power grows there are few who even dare question its claims over Tibet. The Dalai Lama has become more important than ever to Tibetans since he left his homeland, according to Phuntsog Wangyal, who also fled in 1959 after taking up arms against the Chinese. "He not only touches the people's hearts but he is ingrained in their minds. They have total faith in him," he said. "It is impossible for the Chinese to destroy this image in his lifetime. But it is inevitable that he will die." As a founding trustee of the London-based Tibet Foundation, Phuntsog Wangyal believes the sheer charisma of the present Dalai Lama will be hard to replace. "Who will take up his mantle? There is no-one equivalent to him. I don't think anyone will be able to have that kind of authority." The extent of that authority was graphically displayed recently when thousands of people in Tibet threw their rare animal skins onto huge fires after the Dalai Lama criticised the use of products from endangered species. Samdhong Rinpoche is the first elected prime minister of the government-in-exile. He was chosen in 2001 by members of the Tibetan diaspora as part of an attempt to democratise a movement that has for decades revolved around the Dalai Lama's personal charisma, spiritual strength and towering reputation. "By institutionalising the continuity of leadership, the arrangements are now in place to avoid a vacuum and make the Tibetan people not so dependent on the Dalai Lama," he told the BBC News website. But he stressed that there could be no substitute for a Dalai Lama. The usual search would take place for a reincarnation, using the traditional mixture of portents, omens and guidance from senior lamas. The Dalai Lama has said he expects his successor to be found in a "free country", so he can carry on what he calls his "unfulfilled mission". In an apparent concession to Beijing, however, Samdhong Rinpoche said that if the 14th Dalai Lama were to be allowed to return to Tibet within his own lifetime, the 15th would be found there. "If not, then of course he could not be born under occupation". China says it wants the next Dalai Lama to be chosen under its own supervision. It is highly unlikely to accept someone from beyond its borders. The long stretch between the death of one Dalai Lama and the adulthood of the next has always been a time of division and political weakness. Kalsang Phuntsog Godrokba, president of the radical, but influential, Indian-based Tibetan Youth Congress, believes the Chinese plan to fill the vacuum with a new Dalai Lama of their own choosing, just as they have done with the Panchen Lama - the second most senior Tibetan spiritual leader. In 1995, the Dalai Lama recognised a six-year-old boy in Tibet as successor to the 10th Panchen Lama, who died in 1989. China detained the boy and chose another in his place. The original boy has not been seen since. "The Chinese definitely want to see the Dalai Lama die so they can have a Dalai Lama of their own", said Mr Godrokba. But he believes the non-violent, moderate path espoused by the present Dalai Lama could be abandoned by Tibetans after his death. 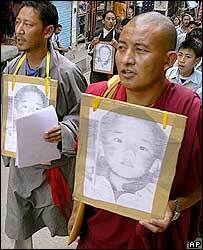 "Violence is something in the hearts and minds of Tibetans. But so long as we have the Dalai Lama it is not easy to organise anything. It will take time," he said. "The Tibetan Youth Congress's commitment to independence will never change," he added. According to many analysts, time is on China's side. They say Beijing is deliberately stalling in its sporadic talks with the Dalai Lama's representatives, since it believes that after his death the Tibet issue will simply vanish from the international agenda. But others think China should capitalise on the prestige of the current Dalai Lama by reaching a settlement now, rather than waiting to see what his followers may do in his absence. Samdhong Rinpoche said contacts with Beijing were likely to come to a halt in the absence of the spiritual leader, since China refuses to recognise the government-in-exile. It was therefore important to reach agreement soon, or there would be "deadlock", he argued. There is growing speculation that the Dalai Lama's dream of visiting Tibet - or at least some Tibetan parts of China - might indeed become reality before he dies. Earlier this month, China renewed its offer to discuss such a visit if he made it clear he had "completely abandoned Tibetan "independence". The prospect of having more control over his successor just might tempt China to relax its conditions. But Beijing is also aware of the danger - that the high emotions aroused by the return of Tibet's god-king after half a century could lead to the biggest demonstrations yet against Chinese rule.